Rubber stair treads from Sure-Foot are a great way to ensure safety on slippery surfaces wherever you anticipate heavy foot traffic. These solid black rubber stair treads provide an anti-slip solution that doesn’t compromise the appearance of your stairs. Coated with a proprietary blend of mineral abrasive epoxy grit, these stair treads also offer a 2″ wide abrasive grit strip inlaid in the tread. Grit coated stair treads provide slip resistance, durability, and a permanent anti-slip solution. 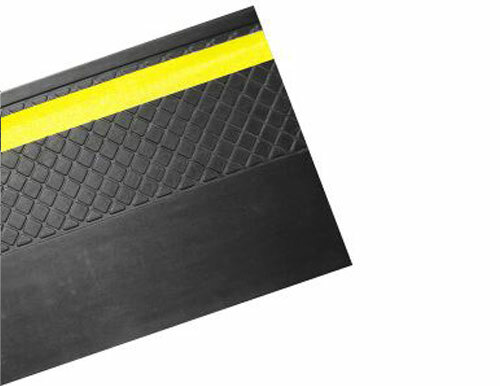 Fiberglass step covers and panels are lightweight and ideal for use on structurally sound steps. To clean simple sweep to loosen and remove dirt, then clean using a general purpose industrial floor cleaner. Sure-Foot is a leading expert in safety and anti-slip flooring products. We can help you prevent unnecessary slip and fall risks. Contact us or request a product sample today!